This year, I want to say “Yes” to Eating Healthier in 2018. I have been working hard in the last few years to take care of my body. I am excellent at working out and getting enough sleep, but I struggle with eating healthy and somewhat clean foods. 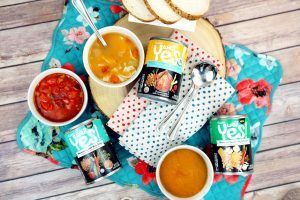 I am making it a big goal in 2018 to eat better with the help of Well Yes!® Soups! I turned 40 last August and I feel that this would be a great time to really work towards achieving this goal. I am planning on working on one small goal each month in 2018 to help me achieve my overall goal of eating healthier. I have found that setting small goals for myself each month works better for me than setting a big goal. I thought it would be nice to set aside a separate goal each month for eating healthier. Some of these might be drinking more water and cutting back on the sugary bottled coffee drinks that I love, planning healthier dinners for my family (cutting out red meat, doing vegetarian dinners once or twice a week) and incorporating more fruits and veggies in my diet. I love Well Yes! Soups, because they are deliciously crafted with real nutritious ingredients and they don’t contain any harmful ingredients. Some of my favorites are their Chicken Noodle, Butternut Squash Apple Bisque and Minestrone with Kale soups. 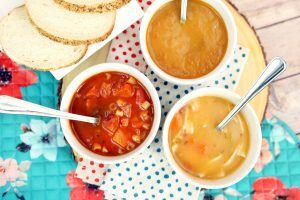 You can find these soups at your local grocer and there are many other flavors to choose from. 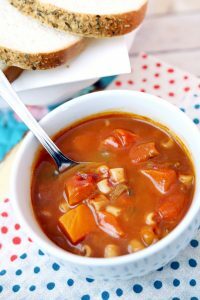 These soups will be perfect for when I’m craving something with flavor, but will keep me on track with my goals. 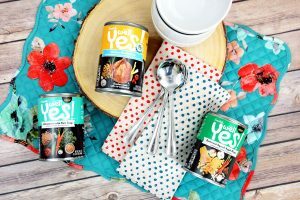 Click HERE for a coupon for savings on Well Yes! Soups! These soups are made with nutritious ingredients, like chicken meat with no antibiotics, sweet potatoes, kale and quinoa. They are crafted with care. Are made with non-gmo ingredients. All Well Yes! soups are definitely “A Soup in the Right Direction®”! How are you saying “Yes” to taking better care of yourself for the New Year? Follow Well Yes! soups on Instagram and Facebook.